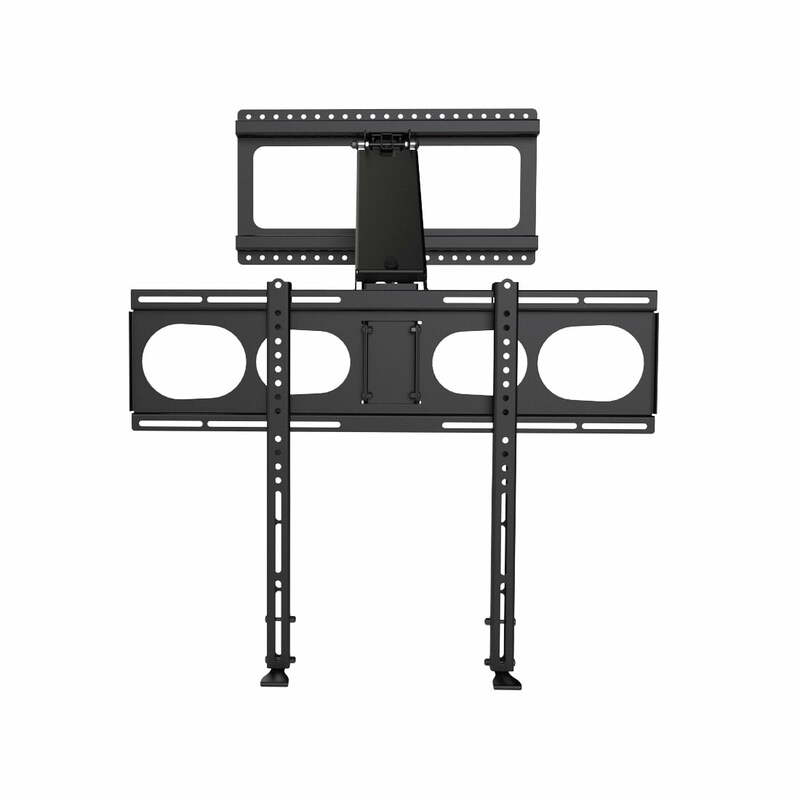 SKU: MM340 Category: TV Wall Mounts larger than 42"
The MantelMount MM340 Standard Pull Down TV Mount gives you a tremendous range of motion, several exclusive features, complete safety, AND the incomparable MantelMount engineering & craftsmanship, …all in one entry-level Pull Down TV Mount! Winner of multiple industry awards, MantelMount’s patented construction combines the highest-quality automotive gas pistons with lightweight alloys and state-of-the-art counterbalanced technology, allowing anyone to easily pull a large flat screen TV off-the-wall up to 16 inches, down another 29 inches over the fireplace to an optimal and comfortable eye-level, and then swivel it left or right 30°. Now EVERY part of the room is the best seat in the house. 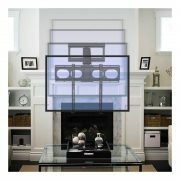 No more TV glare, neck stain, eye-strain or headaches. 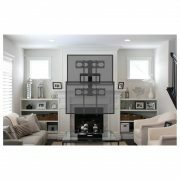 Now with the ultimate above fireplace TV mount, you have true comfort and the perfect TV view every single sit down. 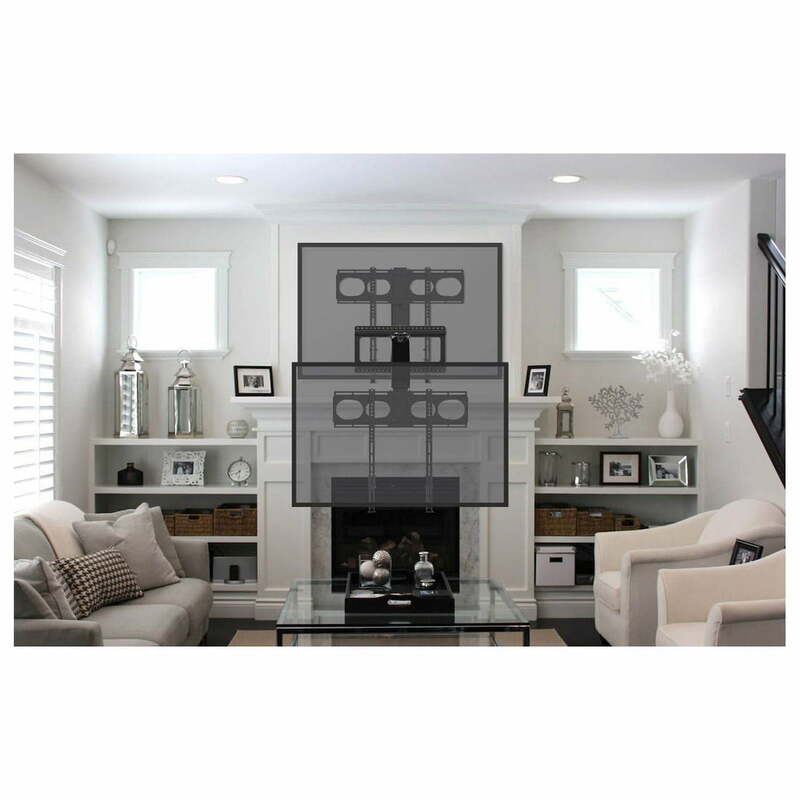 Placing a TV above a fireplace moves the image you’re watching well above eye level. Cranking your neck into an unnatural position causes neck pain, eye strain & chronic headaches. MantelMount not only offers tilt and swivel but also allows you to easily pull the TV down off the wall and position it in front of the fireplace at eye level, then just as easily push it right back up. No more neck strain, headaches or TV glare. 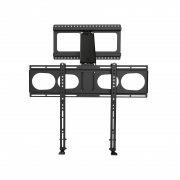 No other entry-level TV mount has better functionality, range of motion or is designed for safer and easier use. 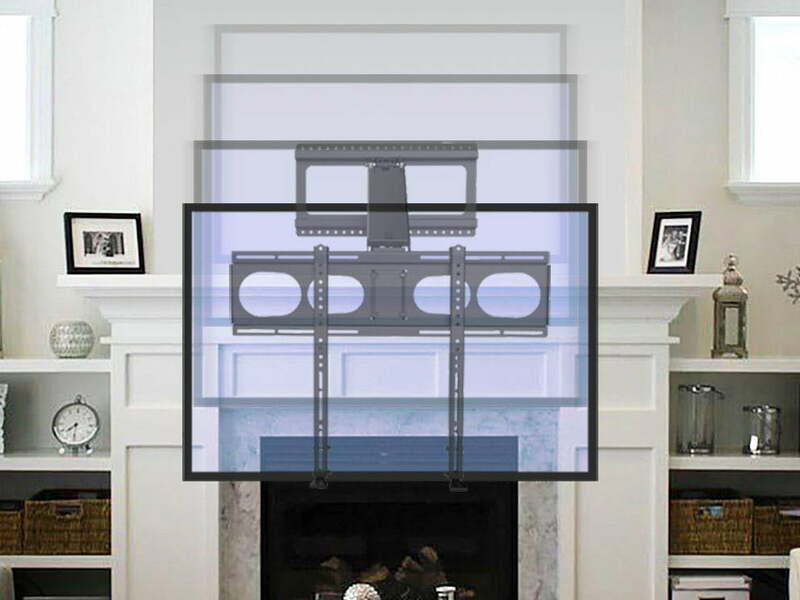 If you’ve mounted a flat screen TV before you can install MantelMount. Our step-by-step installation guide walks you through the install as if our mechanical engineers are there with you! The MantelMount MM340 is built with correct geometry. This ensures that the force from the gas springs is consistent from light TVs to heavy TVs. Imitation mounts are built with INCORRECT geometry. Some TV weights are very heavy for these mounts to lift in the upper position, and will not stay down in the lower position. With incorrect geometry comes a major decline in performance and safety. We use enhanced auto-stabilization with our gas springs to ensure that if one spring is stronger than the other, it won’t bias the mount and will maintain a level TV over time. All of the MantelMount ranges of motion have adjustable stops to prevent any part of the mount from hitting the wall or mantel. 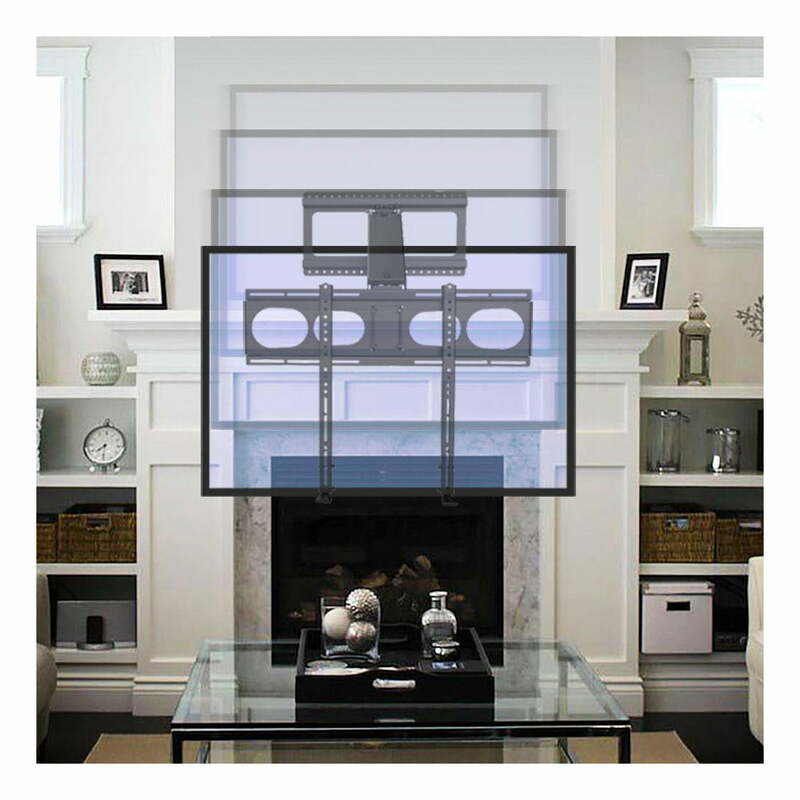 If raising your TV from the swiveled position, MantelMount automatically straightens the TV so that it doesn’t hit your wall. Modern TVs are getting thinner and more fragile. The pull-down handles on MantelMount direct all of the pulling forces directly to the mount instead of pulling on the frame of the TV itself. These handles make it easy for anyone to pull a TV as heavy as 90 lbs off the wall and down to a comfortable viewing level. 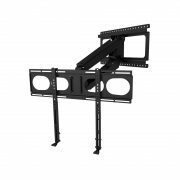 MantelMount covers all of your safety, feature and functionality needs to assure you have the RIGHT Pull Down TV Mount™ for the job at hand. Our MM340 Standard Mount has been UL Listed for safety by successfully undergoing 6000 cycles of full range motion. We take tremendous pride in delivering to you a product that you can depend on the safety and performance in for years to come.